It's certainly possible to find out what data is missing in ones collection using ProfilerQuery or other tools, but it's not quite so easy to get an overview of all that's missing. That's why I wrote ProfilerMissing. 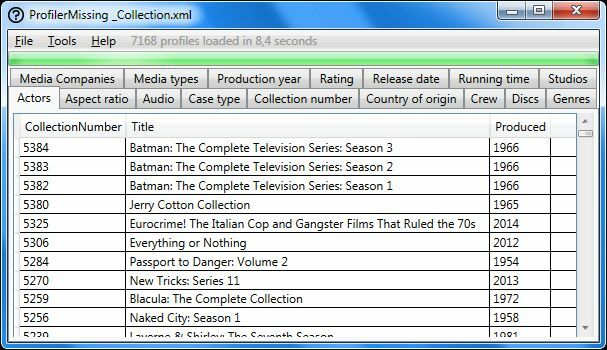 Just as with ProfilerQuery, this program works off an exported collection file. It reads the file and create a tab for each type of data that's missing. Under Tools -> Settings you can specify items that you want to exclude. SRP and Subtitles are excluded by default. SRP since it is so often missing, and Subtitles because quite often there are none. But you can include them if you feel like it. Boxset parents are not included, unless they are DVD/BD combos. I haven't had the energy to write any documentation yet, but there is a rudimentary download page here. If anyone cares to testdrive ProfilerMissing, I'd be happy to hear your views on it. I've tried it and it's actually quite a nice tool. Thanks for it. I've found one little mistake. The Media types tab is actually the Overview tab. Thanks, I'll take a look at that. The Media types tab is actually the Overview tab. Well, actually both Media Types and Overview got reported on the Media Types tab. Fix now in version 1.0.1. Same link as in my original post. Just started working with this. Excellent program, thank you very much for sharing. Is it possible to complete with other fields as purchase date/place/price, rating details, runtime, review... ? Running time is already implemented. I'll certainly look at the other fields you asked about. Not sure how useful Rating Details would be, as there often are none, but hey - the same can be said for Subtitles, and I've implemented that, so why not? Purchase date/place/price and review implemented in version 1.1.0. Note 1:Rating details not implemented yet because it requires a change in ProfilerData.dll. But I'll take a look at that too, in the near future. Note 2: I had to rethink how exclusions are saved to the registry, so this version will set them back to default the first time you run it. Note 3: Review only looks at the Movie review. I have added Rating Details. But perhaps more importantly I have speeded up data handling significantly. In the previous version it could take excruciatingly long to switch tabs if you had a large collection. Now it's almost instantaneous. Well, I'm on a roll tonight! I just published version 1.3.0. What's new? I added a new tab named "* Summary *" where I list per profile all that is missing in that profile. So now you can see what's missing per field, or per profile. If you find that analyzing your whole collection at once gets daunting, you can export just a part of it at a time. In Profiler, Flag All Above Current, Flag All Below Current and Invert Flags are useful menu commands to flag just a section of the collection. Then select Flagged Profiles when exporting. Gunnar, played around with PM and already could fill a few holes - a very useful program. A suggestion, if I may: Is it possible that the (expanded) window position/size could be saved?